The sesame seed is a powerpacked superfood and is probably the oldest of all cultivated seed crops. It has been regarded as a food of high value throughout Asia since ancient times. 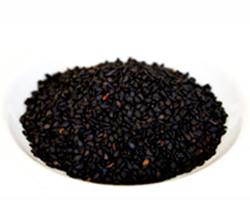 There are primarily two types of sesame seeds; black and white. The black variety yields the best quality of oil and is also best suited for medicinal purposes. The white seeds are extremely rich in calcium and are useful in all cases of calcium deficiency. 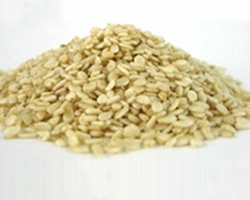 The oil extracted from sesame seeds is of very high medicinal quality. It has the finest flavour and a high boiling point. The seeds are exceptionally rich in iron, magnesium, manganese, copper, and calcium and contain vitamin B1 (thiamine) and vitamin E (tocopherol).They contain lignans, including unique content of sesamin, which are phytoestrogens with antioxidant and anti-cancer properties. Sesame oil is known to have the highest antioxidant content. Sesame seeds also contain phytosterols associated with reduced levels of blood cholesterol. Sesame seeds find tremendous use in the following sectors. Breads, Sauces and finds wide spread use in the Health Food sector. Mahalaxmi Consultancy, an integral division of the Mahalaxmi Group, has introduced a range of products including all kinds of sesame seeds such as Natural White (95/5, 98/2, 99/1), Brown, Black and Hulled Sesame Seeds. 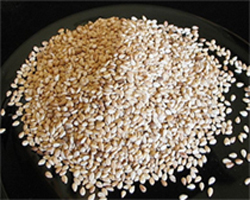 We also supply Mechanically Hulled Sesame Seeds and Auto dry/Sun dry seeds. Furthermore our product is available in two types of packaging, namely 25 kg and 50 kg in poly or paper bags. We are deeply committed to providing the finest quality agro commodities to all our clients across the world.